"Thank you so much for our amazing "JAWS" Wedding Cake! We were so excited to see it on the day and amazed at how prefect every last detail was, right down to the mini version of our dog Marty. 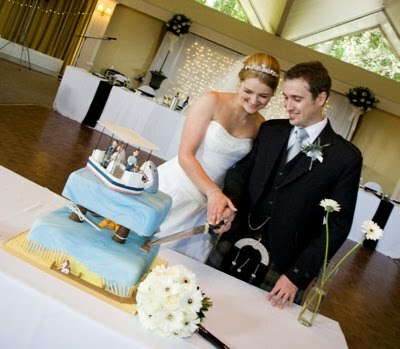 All of our guests thought it was the best Wedding Cake they had ever seen and of course tasted! We hope that you had fun making it as all of your work was greatly appreciated..."
It's truly looking one of surprising featured source to amazed someone. I am totally crazy to see the concept and design of this wedding cake. It's elegantly looking exceptional for me. Thanks for sharing.